#stampinup #creationstation #faithfulinkspirations Hey everyone! 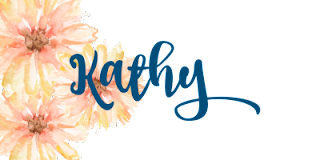 Isn't our April banner amazing?! It was created by our design team member Liz Price. She's so creative--and so clever! 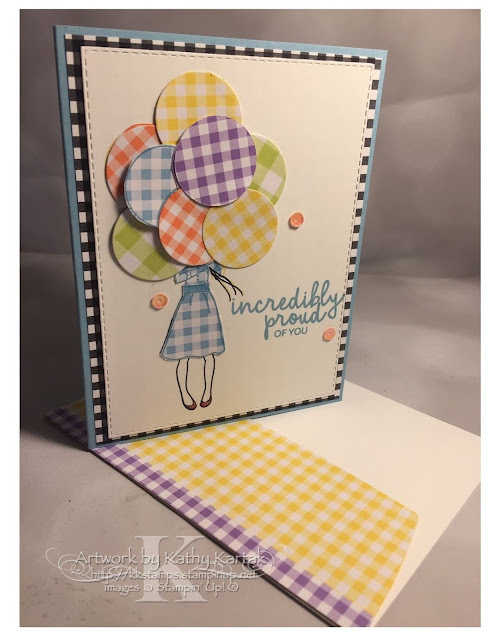 When I was thinking of this month's creation, I knew I was going to use the pretty Gingham Gala 6" by 6" Designer Series Paper, but I wasn't sure what I was going to do with it. Then an idea popped into my head. When I think of gingham, I think of Dorothy from the Wizard of Oz. Her blue gingham pinafore is just the cutest thing. So I recreated Dorothy for you. I thought you might like to see a peek behind the curtain (get it?) at my creative process. Here's my prototype design. I stamped the various parts "Dorothy" from the "Hand Delivered" host set onto the Gingham Gala paper and fussy cut the pieces. I adhered them to the image I stamped onto a Whisper White panel. I made myself some notes and then I made the actual card. For the final product, I used the largest Stitched Rectangle Framelit to cut the Whisper White panel. I used the Stamparatus to get the sentiment placed just right--it's from the "Incredible Like You" stamp set and stamped in Balmy Blue. I stamped the bottom half of the girl in Memento Tuxedo Black Ink, and I stamped the top part of the image in Daffodil Delight Ink, so it was very light on the background in case the fussy cut balloons didn't quite fit. However, I found that the smallest circle framelit from the Layering Circles set was just about the right size, so several of the balloons on the finished project are cut with that. 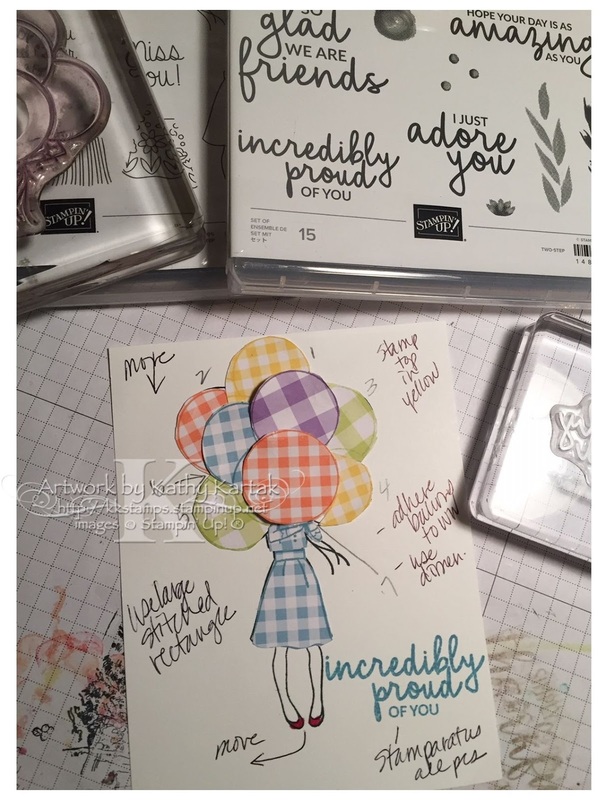 I used a Basic Black Stampin' Write Marker to draw in the balloon strings. And I colored in her belt with a Light Balmy Blue Stampin' Blend. I layered the panel onto a 4-3/8" by 5-5/8" piece of black and white checked Botanical Butterfly Designer Series Paper (left over from Sale-a-Bration) and then adhered everything to a Balmy Blue Card Stock Card base. I used some extra Gingham Gala DSP to decorate the envelope. To finish the card, I added three Grapefruit Grove Gingham Gala Adhesive Backed Sequins. And then I colored "Dorothy's" shoes with a Light Cherry Cobbler Stampin' Blend and Clear Wink of Stella--so she'd have some ruby red slippers! I hope you enjoyed my project. It was fun to make! 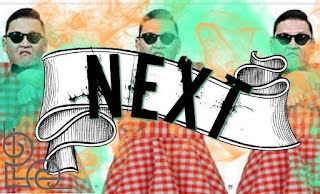 Now use the "next" button and see what our next design team member has in store for you! !